A wise man once said, “Sometimes the only chance we have to save a life is by preventing the incident from occurring in the first place.” As a second grade public school educator and a Juvenile Firesetter Interventionist with my local fire department, I have seen firsthand the problem of children and fire. Nationwide, juvenile firesetting is a serious community problem. Fires set by juveniles are the second leading cause of all fatal home accidents and the leading cause of home deaths among children. 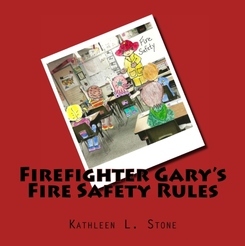 These statistics prompted me to become a Juvenile Firesetter Interventionist and to write this fire safety book. ​The task of organizing and implementing a Youth Firesetter Intervention program may at times seem overwhelming. There will always be more to learn; new information continues to advance in the field of arson and youth fire setting. One thing, however, remains the same … every time a child sets a fire they put themselves and others in danger. Fire can cause serious damage, injuries, and death. One out of every three children that die in a fire started the fire themselves! You and your program could well be what makes the difference in the lives of these youth, their families, and their community.